Primary Thyroid Lymphoma (PTL) is defined as a lymphoma involving only the thyroid gland or the thyroid gland and adjacent (regional) neck lymph nodes. Primary thyroid lymphoma is a rare entity that accounts for 1% to 5% of all thyroid malignancies and comprises approximately 2% of all malignant extra nodal lymphomas. It is typically presenting as a rapidly enlarging, painless thyroid mass, which may cause pressure symptoms of the aerodigestive tract. Thyroid lymphomas divided into two groups: non-Hodgkin’s lymphomas of B-cell origin and mucosa-associated lymphoid tissue (MALT) lymphomas. Most thyroid lymphomas are B-cell origin non-Hodgkin’s diffuse large cell type lymphomas and develops in 50%–70% of all lymphomas. The more indolent lymphomas are the subgroup of MALT lymphomas comprising approximately 6% to 27% of thyroid lymphomas. Pure MALT thyroid lymphomas tend to have an indolent clinical course with an excellent prognosis, whereas the diffuse large cell types alone or mixed have a more aggressive clinical course. Hashimoto’s thyroiditis appears to be associated with the development of MALT lymphomas. The exact mechanism of malignant transformation of benign lymphoid infiltrates seen in chronic thyroiditis remains unknown. The annual incidence rate is 2 per million persons, with female predominance, typically present at ages of 50 and 80 years, with a peak incidence at 60 years. Chronic lymphocytic thyroiditis or Hashimoto’s disease is found in more than 90% of the reported cases. The relative risk of thyroid lymphoma in patients with chronic thyroiditis is 70 to 80 times higher compared to the normal population. It is speculated, that malignant transformation of lymphocytes is the result of chronic stimulation by thyroiditis. All thyroid lymphomas are diagnosed as a rapidly enlarging mass in the neck. Patients are often euthyroid, although symptoms of hypothyroidism can be present in as many as 10% of patients. About 1/3 of patients experience compressive symptoms such as dyspnea, dysphagia, stridor, and hoarseness, and up to12%of patients report pain over the thyroid. Also 10% of patients present with fever, night sweats, or weight loss. On physical examination, the neck mass is typically hard with a smooth surface and can be unilateral or bilateral. Ultrasonography is the initial diagnostic modality used in the work-up of thyroid enlargement and nodules. A fine needle aspiration biopsy (FNA) is diagnostic study of choice. Cytopathologist can diagnose lymphomas based on morphologic features, such as noncohesive large-sized cells with a basophilic cytoplasm, and coarse chromatin pattern within the nuclei. There are still challenges in FNA diagnosis of thyroid lymphoma, particularly due to the histological similarities with thyroiditis and the high coincidence of these pathologies within the same gland which results in increased false-negative rates from sampling error. FNA with immunohistochemistry and flow cytometry will have better diagnostic value in detection of Primary Thyroid Lymphoma. Immunohistochemistry, the process whereby antibodies are used to detect antigens in biological tissues, has improved the accuracy of cytology in diagnosing lymphoma. 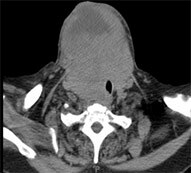 Open (surgical) biopsy may be indicated to confirm the diagnosis and identify the subtype of Primary Thyroid Lymphoma. MALT lymphomas and the mixed large cell lymphomas are difficult to diagnose on morphology alone, thus immunocytochemical staining must be frequently applied. Once the diagnosis of Primary Thyroid Lymphoma is made, the next step prior to treatment is staging. Staging is based on the Ann Arbor system. Computerized tomographic (CT) scans of the head, neck, chest, abdomen, and pelvis or fluorodeoxyglucose positron emission tomography (PET) (FDG-PET) scanning should be performed as the primary technique for staging. The Ann Arbor stage classification is most widely used to prognosticate primary lymphoma. Approximately 50% of patients have disease confined to the thyroid gland (stage IE) and 45% have disease in locoregional lymph nodes, in addition to the thyroid (stage IIE). The remaining patients have additional disease in nodes located on both sides of the diaphragm (stage IIIE) or with disseminated disease (stage IV) . The overall 5-year survival for each stage is stage IE 80%, stage IIE 50%, stage IIIE, and stage IVE less than 36%. Poor prognostic factors include advanced stage of the tumor (> stage IE), size greater than 10 cm, mediastinal involvement, rapid clinical growth, and the presence of dysphagia or stridor. The histologic subtype appears to have a significant influence on prognosis. MALT lymphomas appear to be diagnosed at an early stage and behave in an indolent fashion. In contrast, diffuse large cell and mixed large cell lymphomas behave more aggressively and may be diagnosed with disseminated disease. The overall survival rate for MALT lymphomas is greater than 90%. Because thyroid lymphomas are radiation and chemosensitive, the combination of locoregional radiation and chemotherapy (cyclophosphamide, doxorubicin, vincristine, and prednisone) is the mainstay of treatment for diffuse large B-cell thyroid lymphomas. Studies have failed to demonstrate an advantage in extensive surgical resection of thyroid lymphoma. Surgery may play a major role in the palliation of symptoms secondary to obstructive thyroid lymphoma, such as surgical decompression of the trachea and esophagus. Unlike diffuse large cell lymphomas, MALT lymphomas localized to the thyroid gland have been shown to respond well to local therapy, such as total thyroidectomy or radiation therapy alone, surgery plus radiation therapy does not appear to result in better outcomes than RT alone. Although most MALT lymphomas of the thyroid are diagnosed as stage IE or IIE disease, patients with a more advanced stage of the disease (disease extending beyond the locoregional lymph node basins) should undergo multimodality therapy similar to that described for diffuse large cell lymphomas. Stein SA, Wartofsky L. Primary Thyroid Lymphoma: A Clinical Review. J Clin Endocrinol Metab. 2013 May 28. 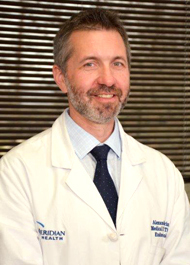 Sakorafas GH, Kokkoris P, Farley DR. Primary thyroid lymphoma: diagnostic and therapeutic dilemmas. Surg Oncol. 2010 Dec;19(4):e124-9.